Man wants but little, nor that little long; How soon must he resign his very dust, Which frugal nature lent him for an hour! Nature always wears the colors of the spirit. To a man laboring under calamity, the heat of his own fire hath sadness in it. I don't know if it is all (man's fault) but the majority is, for the most part, it is man who continuously slaps down nature. Our souls must become expanded by the contemplation of Nature's grandeur, before we can fully comprehend the greatness of man. Man is a talking animal and he will always let himself be swayed by the power of the word. Machines won't change human nature. 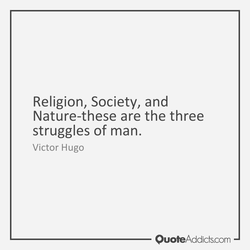 Man is homo religiosus, by 'nature' religious: as much as he needs food to eat or air to breathe, he needs a faith for living. A little wit and a great deal of ill-nature will furnish a man for satire; but the greatest instance of wit is to commend well. Vice is man's nature: virtue is a habit -- or a mask. . . . The foregoing maxim shows the difference between truth and sarcasm. No man can become perfect until he knows his true nature. And the person who knows his or her true nature cannot be an imperfect. Poetry strengthens that faculty which is the organ of the moral nature of man, in the same manner as exercise strengthens a limb. A man may twist as he pleases, and do what he pleases, but he inevitably comes back to the track to which nature has destined him. If a man deliberately abstains from wine to such an extent that he does serious harm to his nature, he will not be free from blame. A superficial education would be worse than none. 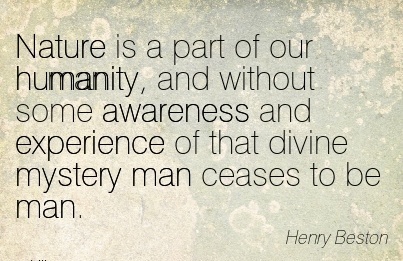 But a full education would open every man's eyes to the nature of human existence. Every man by nature is a freeman born; by nature no man cometh out of the womb under any civil subjection to king, prince, or judge. Modern man was not meant to do his best work before forty but is by nature, and is becoming more so, an afternoon and evening worker. Art will never come except from some small disregarded corner where an isolated and inspired man is studying the mysteries of nature. There is no such thing in man's nature as a settled and full resolve either for good or evil, except at the very moment of execution. 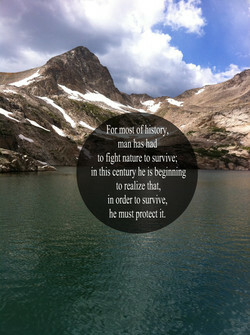 First it was necessary to civilize man in relation to man. Now it is necessary to civilize man in relation to nature and the animals. The peace for which every soul strives and which is the true nature of God and the utmost goal of a man is but the outcome of harmony. That amid our highest civilization men faint and die with want is not due to the niggardliness of nature, but to the injustice of man. Each man deciphers from the ancient alphabets of nature only those secrets that his own deeps possess the power to endow with meaning. Listen - man is a child of Nature. When he turns against his mother - he's done! He may not find out about it right away, but he will. Though it might be nice to imagine there once was a time when man lived in harmony with nature, it's not clear that he ever really did. For to accuse requires less eloquence, such is man's nature, than to excuse; and condemnation, than absolution, more resembles justice. Everywhere man blames nature and fate yet his fate is mostly but the echo of his character and passion, his mistakes and his weaknesses. My father, whose way was to force every event in nature into an hypothesis, by which means never man crucified TRUTH at the rate he did. ...nothing so liberalizes a man and expands the kindly instincts that nature put in him as travel and contact with many kinds of people. The creative man with an insight into human nature, with the artistry to touch and move people, will succeed. Without them he will fail. Man cannot afford to be a naturalist, to look at Nature directly, but only with the side of his eye. He must look through and beyond her. 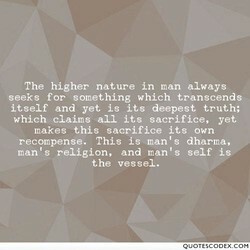 Man has wants deeper than can be supplied by wealth or nature or domestic affections. His great relations are to his God and to eternity. Man is by nature a lover. Only he has yet to discover the real thing to love. This quest awakens him to the fulfillment of his real Self. There is a debt of service due from every man to his country, proportioned to the bounties which nature and fortune have measured to him. Art is not tame, and Nature is not wild, in the ordinary sense. A perfect work of man's art would also be wild or natural in a good sense. Nothing from outside can stop a man from enjoying lasting peace and permanent joy in life, for it is the essential nature of his own soul. A man shrinks or expands into the degree and nature of his ambition. Ambition needs to be cultivated and refined, and yet has no teachers. Auld Nature swears the lovely dears Her noblest work she classes, O; Her 'prentice han' she tried on man, And then she made the lasses, O! Man's rights are evident branches of, rather than deductions from, the duty of self-preservation, commonly called the first law of nature. Prejudice renders a man's virtue his habit, and a series of unconnected arts. Though just prejudice, his duty becomes a part of his nature. Each thing lives according to its kind; the heart by love, the intellect by truth, the higher nature of man by intimate communion with God. Man is neither by birth nor disposition a savage, nor of unsocial habits, but only becomes so by indulging in vices contrary to his nature. Rugged strength and radiant beauty-- These were one in Nature's plan; Humble toil and heavenward duty-- These will form the perfect man. One fact must be familiar to all those who have any experience of human nature - a sincerely religious man is often an exceedingly bad man. Nature can be trusted to work her own miracle in the heart of any man whose daily task keeps him alone among her sights, sounds and silences. The more experience and insight I obtain into human nature, the more convinced do I become that the greater portion of a man is purely animal. There is religion in everything around us, - a calm and holy religion in the unbreathing things of Nature, which man would do well to imitate. It isn't bad judgment to make a man believe he is something. He is by nature inclined to it, and a little encouragement is good for most people. I felt that that experience, because of the responsible nature that I found I acted all during that traumatic time, that I felt that I was a man. 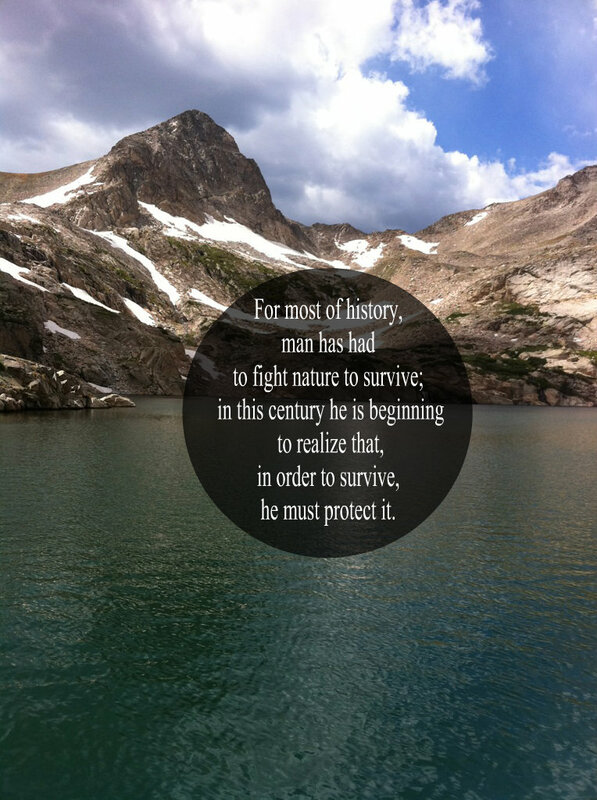 Nature, by its very nature, is very brutal and unequal. However, Man has somehow managed to transform the nature of its brutality and inequality. I believe man suffers from an appalling ignorance of his own nature. I produce my own view in the belief that it may be something like the truth. In the search for truth - that everything in nature seems to hide - man needs the assistance of all his faculties. All the senses should be awake. As if one crime of such nature, done by a single man, acting individually, can be expiated by a similar crime done by all men, acting collectively. Shun fear, it is the ague of the soul! a passion man created for himself--for sure that cramp of nature could not dwell in the warm realms of glory. Man like every other animal is by nature indolent. If nothing spurs him on, then he will hardly think, and will behave from habit like an automaton. Daughters can spend ten percent more than a man can make in any usual occupation. That's a law of nature, to be known henceforth as "Harshaw's Law. Animal life, sombre mystery. All nature protests against the barbarity of man, who misapprehends, who humiliates, who tortures his inferior brethren. This man (Bergman) is one of the few film directors-perhaps the only one in the world-to have said as much about human nature as Dostoevsky or Camus. Every man has by nature the right to possess property as his own. This is one of the chief points of distinction between man and the animal creation. The sickly, weakly, timid man fears the people, and is a Tory by nature. The healthy, strong and bold cherishes them, and is formed a Whig by nature. Youth is the period of harsh judgments, and a man seldom learns until he reaches thirty that human nature is made up not of simples, but of compounds. The passage from the state of nature to the civil state produces a very remarkable change in man, by substituting justice for instinct in his conduct. A man must be of a very quiet and happy nature, who can long endure the country; and, moreover, very well contented with his own insignificant person. You Negroes are not willing to admit it yet, but integration will not work. Why, it is against the white man's nature to integrate you into his house. By nature's law, man is at peace with man till some aggression is committed, which, by the same law, authorizes one to destroy another as his enemy. How it chanced that a man who reasoned on his premises so ably, should assume his premises so foolishly, is one of the great mysteries of human nature. Life is grand, and so are its environments of Past and Future. Would the face of nature be so serene and beautiful if man's destiny were not equally so? 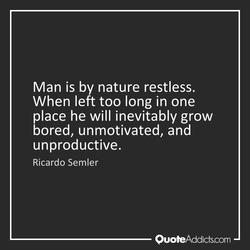 The more a man follows nature, and is obedient to her laws, the longer he will live; the farther he deviates from these, the shorter will be his existence. And thou, all-shaking thunder, Strike flat the thick rotundity o' the world! Crack nature's moulds, all germens spill at once That makes ingrateful man! 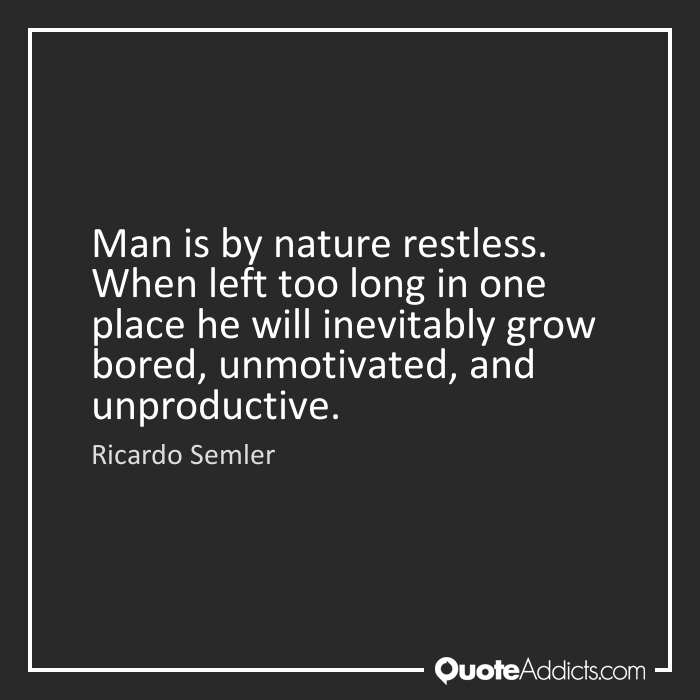 [To learn] is to harness Nature; to spare man all that is most physical, backbreaking, and brutish in the work of production; to make mind master over matter. The scientific study of Nature tends not only to correct and ennoble the intellectual conceptions of man; it serves also to ameliorate his physical condition. The policy of man consists, at first, in endeavoring to arrive at a state equal to that of animals, whom nature has furnished with food, clothing, and shelter. I refuse to accept the idea that the 'is-ness' of a man's present nature makes him morally incapable of reaching up for the 'ought-ness' that forever confronts him. Nature's law, That man was made to mourn. Man's inhumanity to man Makes countless thousands mourn! O Death, the poor man's dearest friend, The kindest and the best! History, as it lies at the root of all science, is also the first distinct product of man's spiritual nature, his earliest expression of what may be called thought. Man and woman become a devil to each other when they do not separate their spiritual paths, for the nature of created beings is always the nature of differentiation. There is for a free man no occupation more worthy and delightful than to contemplate the beauteous works of nature and honor the infinite wisdom and goodness of God. The reflection of nature in man's thought must be understood not lifelessly but in the eternal process of movement, the arising of contradictions and their solution. Nature is a temple, where the living Columns sometimes breathe confusing speech; Man walks within these groves of symbols, each Of which regards him as a kindred thing. Folklore and mythology, as well as man's catastrophic disregard for nature, are the meat of Joseph D'Lacey's horror. But the prime cuts are always compassion and surprise. 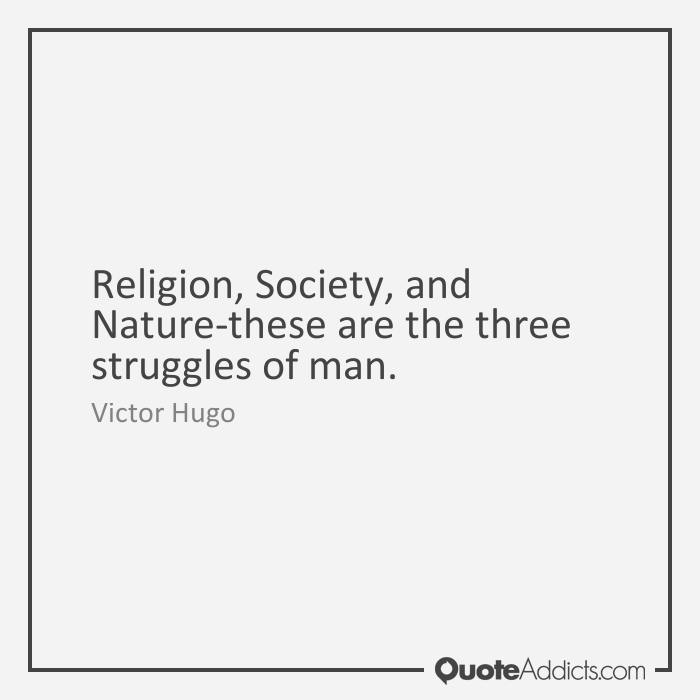 No one has yet been found resolute enough in dogmatizing to deny that Nature made man equal; that society has destroyed this equality is a truth not more incontrovertible. If the gatherer gathers too-much, Nature takes out of the man what she puts into his chest; swells the estate, but kills the owner. Nature hates, monopolies and exceptions. Scarce any man becomes eminently disagreeable but by a departure from his real character, and an attempt at something for which nature or education has left him unqualified. True poetry, like the religious prompting itself, springs from the emotional side of a man's complex nature, and is ever in harmony with his highest intuitions and aspirations. All outward forms of change brought about by wars, revolutions, reformations, laws and ideologies have failed completely to change the basic nature of man and therefore of society. Homosexuality is against nature. Sexual expression is permitted only within marriage, between man and woman, male and female. Anything else is an abnormality and is against nature.